When a garbage disposal is humming or makes a buzzing sound, this means it is still getting power but it is jammed up and unable to spin or churn. To fix this fast, go under the sink, find the hex head wrench tool (Allen wrench), stick it in the hole (breaker socket) on the bottom of the disposer and turn it back and forth. This is to get the flywheel to “unjam” itself and turn freely. The hole we are talking about is on the outside and bottom of the disposer itself, not in the hole in your sink! Garbage Disposal Is Spinning But Will Not Drain? Foreign Object Stuck In Disposer: Something is jamming the disposer blades making them unable to spin freely. Unplug disposer and look into sink drain hole. Inspect for anything jamming the disposer. Remove foreign objects to free the blades. Disposer Jammed: Something put down the sink has jammed the wheel inside the disposer. Use the disposer “jam buster” tool and turn the hex fitting back and forth on the bottom of the disposer. If there is no tool under the sink, grab an Allen wrench set and find the correct Allen wrench to fit the hole. The “flywheel” hole in most garbage disposals is 1/4″. So use a 1/4 inch Allen wrench (hex key) if you do not have the “wrenchette” disposal tool. 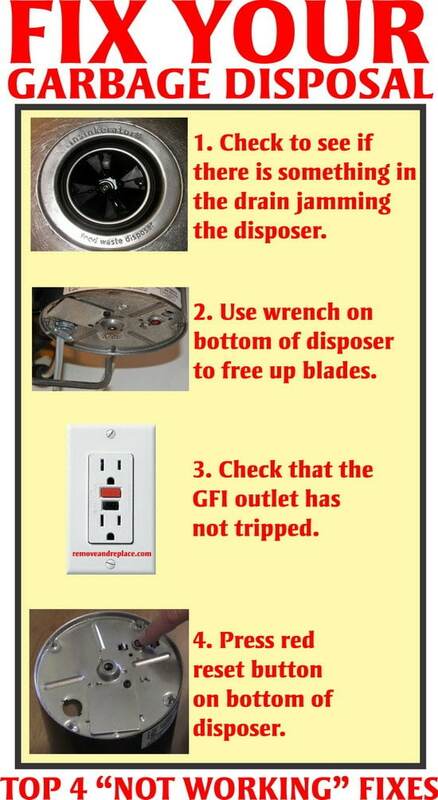 GFI Has “Tripped”: Check that the GFI or GFCI electrical outlet where the garbage disposal plugs in has not tripped. If so press the reset button. Disposer Has “Tripped”: Disposer has overheated or “tripped”. Press the red button on the bottom of the disposer to “reset”. Disposer Has Fried: Disposer has reached the end of it’s life cycle and is KIA. Remove and replace bad disposer. are still having issues getting your disposer to run. I used a 1/4 inch allen wrench…it fixed the problem. I, too, was getting ready to buy a new disposal…..thought I’d search the internet for troubleshooting ideas….this fixed it. Now my wife thinks I’m a genius….thanks. Thanks! I had tried all the steps, except the allen wrench turning from the bottom. I hadn’t even seen the wrenchette? before, but sure enough there it was on the floor of the cabinet under the sink. A couple of full rotations in either direction until it turned relatively easy all the way around and I was good to go. The Allen wrench fixed it! Thank you. I didn’t even know that hole was there until I went looking for it. Thanks! Fixed it in 2 minutes with the allen wrench. Saved me $100. I was getting ready to buy a new garbage disposal. The turning of the blades with the allen wrench fixed it right away. Thanks! My Badger 5 Garbage Disposal has started stopping to run after our dishwasher runs. I am able to fix the jam with the wrench but it happens again after running the dishwasher. It continues to work ok until we start the dishwasher again. Any Ideas? When your dishwasher runs and drains, it goes through the bottom of the garbage disposal, check to see if there is a blockage in the bottom of the garbage disposal. Be sure the “knock out hole” is fully removed from the disposal and nothing is jammed up in the disposal. How do you determine if there is a blockage in the bottom of the disposal? Thanks!!! It was humming but not turning and following your advice turned it with an Allen wrench and it took care of it. Appreciate it! So a spoon fell in the disposal and I couldn’t pull it out. Watched a video of a guy saying to use the wrench on the bottom, so I turned it back and forth and my mom tried to pull it out. She still couldn’t get it and when we went to trade, I couldn’t feel the spoon at all. We turned it on to see if it was still rattling and it did for a second before it stopped and sounded normal again. Did the spoon drop through? Is this okay to leave or should we figure out how to take it apart to remove it still? Thank you so much for the video help!!! We fixed it with the allen wrench trick and did not have to go to Lowes to buy a new one!!! Happy Father’s day to us! OH MY GOD! You saved the day! All I had to do was put the alan wrench in and unjam the machine. Best day ever! I thought I was going to have take the damn thing apart myself or worse yet call somebody! My problem is that the motor runs and then it stops after 2-3 seconds and starts humming. This happened even after I had cleared out all solids in the disposal and clear water is passing through. My disposal is just over a year old. The thing that finally worked for me was the very hot water and liquid soap. After no success doing all the standard stuff (reset, hex, which was totally free), I got all of the water out of the sink down to the blades and then poured liquid dish detergent in, followed by lots of boiling water. Took a while, but after churning and letting it stand and adding another pitcher of hot boiling water, it finally took off. Do NOT put parsnip skins and tops down the disposal! Thanks to the gal who told us about the dawn and hot water (any liquid dish soap will do). thank you sooooo much. the allen wrench worked. i thought i would have to get a new disposal. neat little trick with the wrench. now i also know why that is with the disposal. i’m soo glad you were here to help. Nothing is jamming the blades, I’ve reset the button and turned the breaker socket several times but it still only hums when I turn it on. Any suggestions? Thank you so much! The Allen wrench worked in a second and you saved me a lot of stress! Very straightforward. Thanks for this post! It left me feeling very proud to have fixed my own disposal. It also prevented a seriously gross sink situation! :) Thank you thank you thank you! The hex wrench trick would work briefly but the disposal would jam again almost immediately. We unplugged it and felt for whatever it was jamming the disposal and tried using a flashlight but just could not find it. What ended up working for us was plugging it back in again, filling the sink with hot water and Dawn, and my husband started turning the hex wrench back and forth while I took the stopper out of the drain and let the hot water and soap pour down the drain. It was a solid 2-3 minutes of turning when the water suddenly started draining normally, so he turned it a little more and then tried the disposal and it worked! We then did the ice cube trick you mentioned above just to make sure whatever was jamming it came out. This was super super helpful! Thank you so much for this! I knew about the red button but didn’t know about the hex bolt spot. I thought my Sunday was ruined with the unexpected death of an appliance, but my trusty bicycle allen wrench set (and your instructions) saved the day. Dreaded the idea of having to remove the disposal after a ceramic spoon accidentally fell inside the unit. After inspecting and ensuring the disposal was clear of any major shards, I turn on the unit to find it still humming. This google search saved me the aggravation of removing the unit completely. A simple twist of the Allen screw on the bottom of the disposal did the trick. I had forgotten about that tip. Badger 1/3 hp disposal, getting power but won’t spin. Cleaned out unit and found some sting got wound up in the disposal. Cleared and still wouldn’t spin but has power. Tried reset, but no difference. Used hex wrench and unit is spinning free and clear. Powered up, still won’t spin but has power. Figured some of string may have worked its way under fly wheel so I pulled whole unit out, cleaned thoroughly, took main motor completely off, got under fly wheel and yes, there was a bit of string. Cut out, flywheel spun free and clear. Put whole unit back together, reinstalled, fired it up and yes it still has power but still doesn’t want to spin. What could possibly be causing this as I’ve troubleshooted everything I can think of. I have an Insinkerator evolution excel 2 garbage disposal. It has been vibrating more than it should. I removed the unit from the mount and loosened mounting screws. Now the vibration is better but the mounting unit moves. I can see the flange turn when unit fires up. When i adjusted it to make the unit snug so it wouldn’t move, the vibration returned. Unit spins freely and there is no debris in the unit. Thank you for the great instructions! I was able to get it to turn with the wrench, but then it jams up again. This helped, thanks a lot. The hex key solution worked for me, needed to turn it both ways to free it up. Yay! With this video I was able to fix my garbage disposal with an Allen wrench. SavedSaved me & my daughter $300 using the instructions on this site! Get out your Allen Wrench and fixit yourself!! Plumbers will not repair garbage disposals, only replace! Thank you!!!! The tool fixed it! I have a KitchenAid garbage disposal that hums but does not spin. This disposal does not have any space to place hex wrench to unclog it. I have checked there is not anything large blocking the disposal. What do you suggest? There should be an area on the bottom to place a hex wrench. What is the model number of your KitchenAid garbage disposal? I was able to freely spin from the bottom using an allen wrench but the humming continued. I then tried to get the blades on by giving it a spin while turned on. This actually caused the humming to stop completely – when I flip the switch on now, it’s totally dead. Hope I didn’t do any harm by attempting to spin it while on? Thanks so much for this helpful thread. Try pressing the red reset button at the very bottom of your garbage disposal. If that does not work, make sure the breaker the outlet the disposal is plugged into is not tripped. If power is getting to the garbage disposal and the red reset button did not reset it, you may have a dead disposal. The motor could be faulty. If so it can be repaired by taking it apart and fixing the motor. It may be simple wiring. The plug could be bad, cord, motor, etc… If it is totally dead, buying a new one is a good choice as an average garbage disposal is around $100 US dollars. Let us know what you find. Thanks so much for your prompt reply. The reset button worked – the disposal is now back to just humming (and I’m able to freely spin the wheel using an allen wrench on the bottom). If your garbage disposal is humming, either it is STILL jammed, or the motor is bad. Remove anything that may be jamming the disposer or test to see if the motor is working properly. You will need a multimeter to do so. Garbage disposal hums, but when I use the wrenchette to try and loosen the wheels, it won’t work. I’ve tried turning it both ways but it just won’t budge. what do I do? 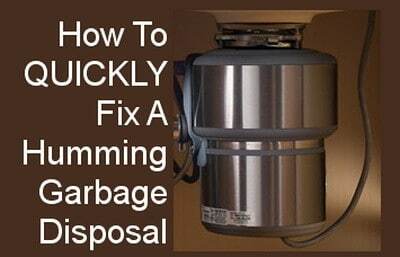 If the garbage disposal will NOT budge using the wrenchette, then something large is in the disposal that will not let it turn. Unplug the disposer and use something to get down inside to see if you can get the item out that is blocking the disposal from spinning. You can use your hand but be SURE the disposal is unplugged from power. I took the allen wrench and spun it around a couple times, which the motor went with it freely. Turned the switch back on and it continued to hum. While on, I took the allen wrench and spun it again, and the blades started to spin. Let it run for a few minutes, turned it off. I then turned it back on and the humming started again. The blades will now only spin if I start it with the allen wrench. Is the motor shot? If you have exhausted all measures to unjam your disposer, then yes the motor may be fried or on the fritz. You can take it apart and check it with a meter to be sure before replacing it. However there may still be some small foreign object in the disposer binding the cutters. Get the disposer running again with the allen wrench and pour some ice cubes down into it to try to fully clean it out and remove anything that may be binding it up. If the disposer still hums and will not start up after this, it may be time for a new one. Be absolute sure your disposer is not simply jammed before replacing it with a new one. So, let me get this straight! This person stuck the allen in the bottom, then turned the disposal on, then turned the allen until the disposal stated to run ! Would the allen wrench then turn at the rpm that the motor is spinning? If so, this sounds a bit unsafe ? I am having the same issue. Is the mechanism where rthe allen is on a some sort of a clutch ? When I spin the shaft with the allen, it spins but seems on the tight side. If it feels tight just keep turning as it is jammed and needs to be “moved” using the allen or hex wrench. Common sense would hopefully make people realize that when un-jamming a garbage disposal with an allen wrench under the disposal, it needs to be TURNED OFF. Read the info on the above page and you will see the correct method to unjam a humming disposer. NEVER RUN THE DISPOSAL WHEN REPAIRING OR UNJAMMING IT, UNPLUG IT TO BE SAFE. The bottom of my garbage disposal (PHCC 394) does not have a hole in which to insert a wrench. Do you have any suggestions for my humming disposal? The cutter blades are most likely jammed. With the disposal OFF, try putting a wooden object down into the disposal and try to spin or turn the cutters to get them un-jammed. Once you have turned them and hopefully un-jammed them… Add some liquid soap and turn the disposal on while running water. If it still hums, try tapping on the side of it with a rubber mallet or similar as this may be able to get the disposal spinning again. If this does not work, you may have something really jammed inside the disposal. Unplug the disposal and feel around down inside for something jamming the cutters. Remove the item or items. Plug disposal back in and see if it spins as normal. USE CAUTION WHEN PUTTING YOUR HAND DOWN INTO THE DISPOSAL OPENING. Wow, the broom handle worked! I pushed as hard as I could and it suddenly broke free. THANK YOU!!!! I’m grateful for your advice. I forgot all about the hex bolt on the bottom. After a couple of hours of stressing out I read your article. A quick twist of an allen wrench and everything is perfectly fine with the dosposal. Thank you. You rock! Fixed my “humming” disposal. Thanks a ton!! Already had to spend money this month to replace the alternator on the car, this single mother is very grateful to you posting this so she could fix a jammed garbage disposal. Thank you! I’d forgotten about the wrench “trick”. worked like a charm — HURRAY! I can run the dishwasher now. THANK YOU!!! Works great! Thanks a million. Thank you so much the first tip worked. This totally worked. THANK YOU!!!! A couple of back and forth movements with 1/4 inch allen wrench! The explanation was clear and precise. I did find the Allen wrench that came with my disposal and had no clue that that is what it is for. Thanks. I have tried to use the jam buster but I can’t turn the wrench in spite of considerable force. Any helpful ideas before I have to call a plumber? Have you made sure there is nothing inside the disposer jamming it? Unplug the disposer and feel down inside it to be sure there is nothing jamming it. Then try the allen wrench at bottom to see if it will turn freely. If no jam and the disposer will not turn, try tapping the side of the disposer with a small hammer while it is running and humming. Sometimes a small jolt to it will get it working as the motor could be jammed and a small jolt will get it back spinning. If not then a replacement may be necessary. When I turned on the garbage disposal this morning it made a humming sound. It has done this before and I got it unstuck with the hex wrench. This time the hex wrench turns the unit freely but it still only hums when I turn it on. The reset button is okay. Hmmmm…..fried? If the disposal turns freely with the hex wrench and it still hums, the motor may be bad or fried as you stated. It may have overheated and needs time to cool but usually will not hum if that is the case. Give it a few hours and try again, if it still hums and spins freely then remove and replace after doing some further troubleshooting. I loosened the disposal by using the Wrenchette. When I turned it back on, it made a noise and the blade inside the disposer seems to be extremely loose and rattles. Can I tighten it? Or what should I do? The disposal was jammed so you used the wrench on the bottom to get it to spin again, correct? Was there any type of rattling before this? You may have something that has fallen into the disposer such as a small metal object or similar. Unplug disposal and check with flashlight in the disposal. See if there is anything in there that should not be. If nothing visual is causing the rattle, you may have loose chopper or motor. Check that nothing is in there rattling first… If still rattles, let us know what make and model your disposer is and we can assist further. Thanks…gotta love google. How did anything ever get done before?! I searched garbage disposal troubleshooting; saw “not humming” and voila…all taken care of!